Hi Guys! So the most insane cold snap has finally hit us up in British Columbia and to say it is feeling a bit like winter is quite the understatement. I mean I just told my mom that I want wool socks and thermals for Christmas, wahhhh!!!! So when Coco and I come home from a long day on set, we are chilled to the bone and tired and we want (um, NEED) a hot delicious dinner super fast! Or when I am in Seattle, and have been at work all day and, well- same scenario: my priority is a fast and easy dinner. 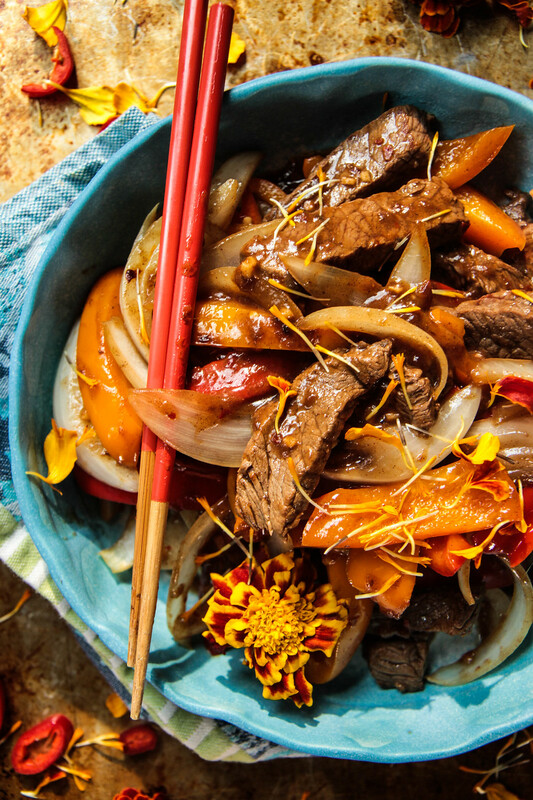 So that’s when I love meals like this 5 Spice Beef and Pepper Stir-Fry! And I have to mention that I have been using Butcher Box which is making things even easier for me with to my door delivery (in this case of grass-fed beef!) And they have been awesome enough to offer you guys FREE Bacon for LIFE!!! if you want to order your own Butcher Box-Soooo worth it! First you want to make the sauce: Add to a bowl the thinly sliced garlic and ginger along with the 5 spice powder, red pepper flakes, tamari and rice vinegar. Whisk everything together until well combined. 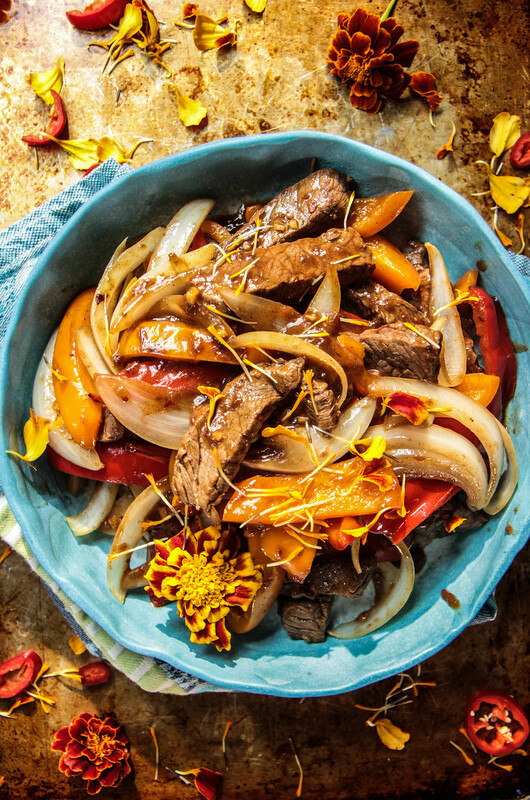 Add the thinly sliced beef directly to the sauce and let it marinate. Bring a heavy pan or skillet to smoking over high heat. Add one tablespoon of coconut oil and melt it in the pan and then shake the extra sauce from the steak and add the thin strips of meat to the really hot pan. Just about 30 seconds on each side then remove the beef to a separate plate and then add another tablespoon of coconut oil to the skillet and then add the vegetables. Cook for a minute or two – the vegetables should still be crisp-tender. Meanwhile, whisk the potato starch into the remaining bowl of sauce and add the beef and sauce to the pan and mix together. Add a few tablespoons of water to the pan and stir to make a looser sauce and immediately serve. I don’t use 5-spice powder enough. But I bet it’s so delicious in this stir fry and give it tons of flavor! My mouth is watering! I wish I could smell this because I know it would be amazing!! Heather, this looks delicious! I have never seen potato starch before. How is it sold? I’m always looking for easy, healthy meal ideas like this!